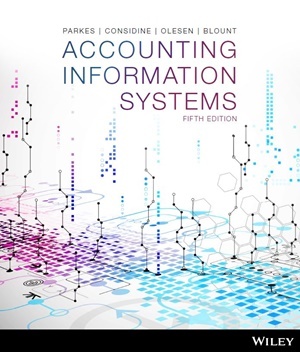 The latest resource from Parkes et al., Accounting Information Systems, 5th Edition covers all the core topics in 14 concise chapters, delivered as an interactive Wiley E-Text: Powered by VitalSource, for a more engaging and active learning experience. This digital resource is a landmark departure from the traditional print text, allowing your students to benefit from the interactive functionality and flexibility that simply cannot be achieved with print. Know your students are getting the best from the Wiley content you know and trust, enhanced with digital delivery. Includes a new chapter on Technology Concepts, discussing emerging technology in the context of accounting and providing students with the most up-to-date information. Revision questions at the end of every section help students to check their comprehension and get immediate feedback. 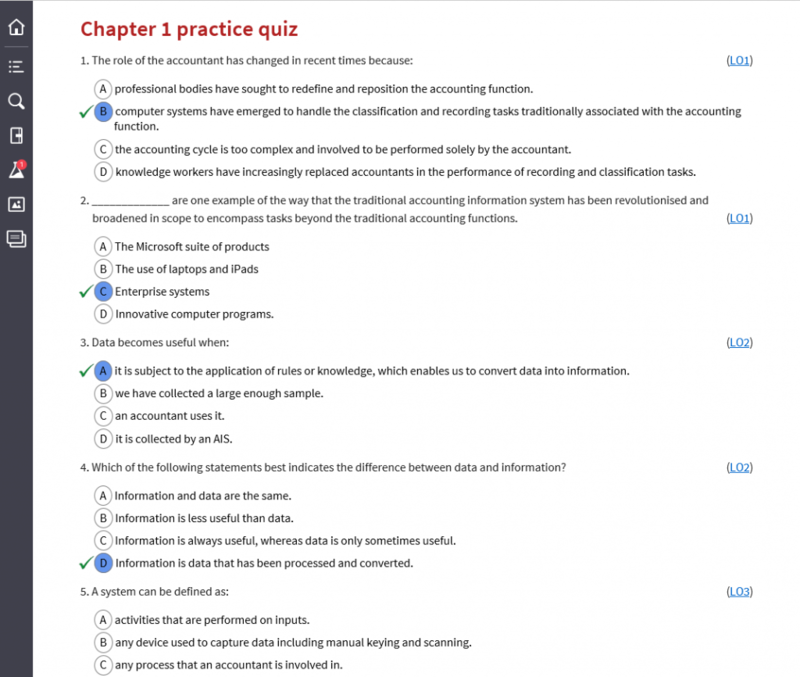 The game-changing Wiley E-Text brings accounting information systems to life and provides students with a rich and engaging active learning experience. See what’s possible when teaching with a Wiley E-Text. Associate Professor Alison Parkes is a researcher, educator, consultant and author specialising in accounting systems. Her professional interests relate to optimising the design of accounting processes and improving the quality of financial data and decision making. She holds a Bachelor of Commerce (Accounting), a Masters (Honours) in Business Systems and a PhD in Business Information Systems from the University of Melbourne. Alison’s practitioner career began in management accounting and progressed through to managing large-scale financial systems development projects. These years of industry experience in both accounting and information systems underpin her academic qualifications and are invaluable in her current role as Director of the MBA program at Taylor’s Business School in Malaysia. Her research exploring relationships between the behaviour of individuals, the technologies they use and the accounting tasks they are performing has been published in numerous international conferences and journals. Brett Considine’s most recent academic role was as a Lecturer in what is now known as the Department of Accounting and Corporate Governance at Macquarie University. 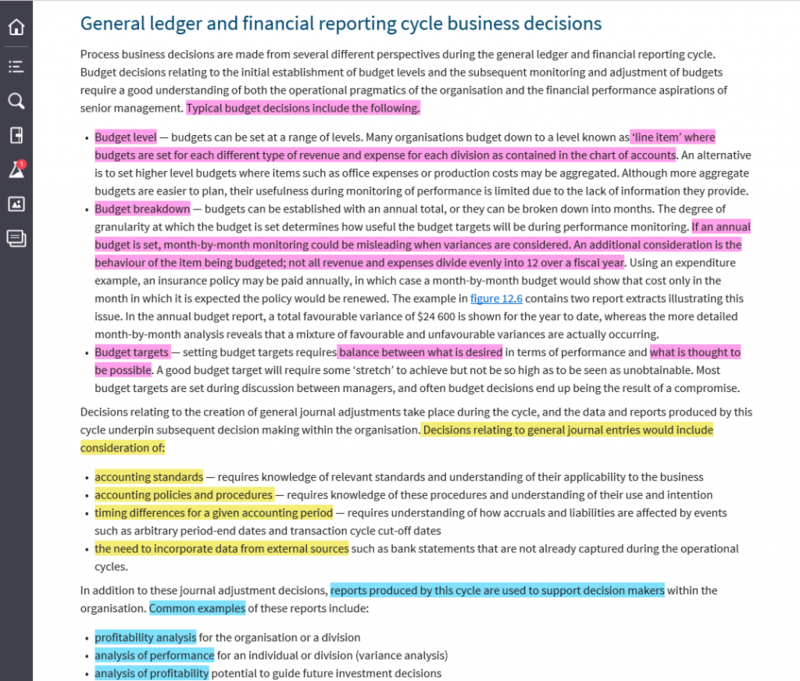 At Macquarie, he coordinated and taught units at the undergraduate and postgraduate levels in areas that included introductory financial accounting, auditing and accounting information systems. He completed a Bachelor of Commerce degree (with Honours) at Melbourne University in 1999, with a specialisation in Accounting and Accounting Information Systems. He has also been a Senior Tutor at the University of Melbourne, teaching in the areas of accounting information systems and introductory accounting. Brett has also enjoyed an involvement with a number of the Residential Colleges affiliated with the University of Melbourne, including Trinity, Ormond, Queen’s, Newman and International House. Additionally, Brett has completed a Graduate Diploma in Education (Secondary) at Australian Catholic University, has some secondary school teaching experience and, in a touch of diversity, has experience in the media as a broadcaster. 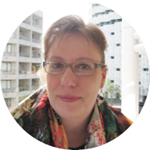 Dr Karin Olesen is a Senior Lecturer in the Graduate School of Management at the University of Auckland. She holds a Bachelor of Commerce in Accounting and Finance, a Masters with First Class Honours and a PhD in Information Systems. She has over 25 years’ experience in teaching in the Accounting and Information Systems and Operations Management Departments across a diverse range of subjects, including accounting information systems, introductory accounting, advanced financial reporting, financial modelling, knowledge management systems and digital media production at the undergraduate and postgraduate levels. The first part of Karin’s career was spent in company and chartered accounting as a financial accountant involved in business planning, budgeting, financial reporting, implementation of accounting systems and taxation preparation for multiple organisations. 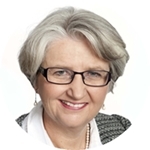 Dr Yvette Blount is a Senior Lecturer in the Department of Accounting and Corporate Governance at Macquarie University. She worked in the IT and banking industries for 20 years prior to embarking on an academic career. Yvette has a Bachelor of Business (MIS), MBA (Professional Accounting) and a PhD in Information Systems. 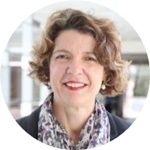 She has taught accounting information systems and information systems for management in undergraduate and postgraduate programs at Macquarie University. Her research interests include the implications of information systems for employee management, technology and flexible work practices, particularly telework (telecommuting) and the role of technologies in learning and teaching. This combination of research and industry experience provides a strong basis for teaching the real-world contexts of information systems. Her research has been published in book chapters and journals. Students can purchase their interactive E-Text or print on demand textbook from Wiley Direct: Accounting Information Systems, 5th Edition (Parkes et al.). We believe that every student has a right to access quality resources, no matter what their budget. Now, we are even better equipped than before to do what we do best; help teachers teach and students learn.